A very accurate alarm clock signalling beginning of a new day. We found rhythm of the typical day we observed so distinct in Northern Territory to be far more varied in New South Wales and Tasmania. That would go also for the Kookaburra’s first light call activities so peculiar in the NT and Kimberley. This species is also easier to spot and come by in NSW (the Blue-Winged Kookaburra). In any case it was very nice to hear them again and a truly friendly welcome – it refreshed our memories from NT soon after we landed in Australia. 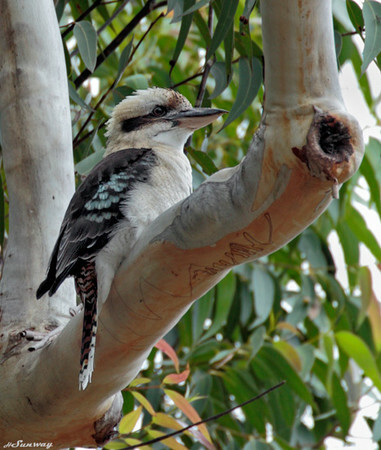 Calls of Kookaburras in the North and East/South-East vary a little but they maintain the same character. Joined by another regulars like Blue-faced Honeyeater Its calls follow shortly afterwards. No small Leaf, no Reflection, no stir of Wind ..
no shutter release .. is for the second time ..